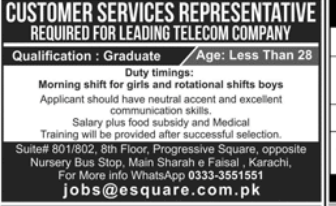 Customer Service Representative Job is available with Private Company in Pakistan, Karachi. It is a Senior Level level role. This applicant should be Bachelor’s Degree qualified for this position. This job will expire on 15 May 2019. This job involves skills like Ability to 'read' customers. Ability to use positive language. Time management skills. Acting skills. Attentiveness,	Closing ability,	Persuasion skills,	Ability to handle surprises, Experience required is 3 Years.